Once upon a time a man called, Jean le Rond d Alembert created a strategy. It is based on the Law of Equilibrium. It claims that after a long losing streak a large winning will come. And if you are winning for a long time, the loss is coming. 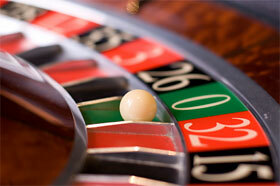 But let us not forget that the roulette game does not care about the laws, as it is based on the chance. And each spin is independent, so the equilibrium cannot be settled. You are making small profit bets, like wagering on black, red, odds and evens. Let's assume that your first bet is $5. You lose it and add one bet unit, which is $10. Then you lose again and add again. Now it is $15. Guess, what? You win. And after you win you subtract one bet unit and now you bet $10. So, every time you lose, you add one betting unit, if you win, you decrease the bet by one unit. It seems that you are "decreasing" the lucky streak, but at the same time you are trying to protect your winning. It is the same as D'Alembert system but vice versa. It is more aggressive than classic D'Alembert. In this betting system you are not concerned about keeping the won chips. Why? Because you do not add one betting unit every time you lose, but you add a betting unit, if you win. It is also recommended to make even bets (black or red, even or odd, ups or downs). The reason is that you do not lose a lot in a short period of time. For example, if your first bet is $5 and you win, your next bet will be $10. It is designed in such a way that you are supposed to win a bit more than to lose. But as all other betting systems it is not very reliable for a long time gambling. It is an advantageous system in the aspect of easy application. You do not need to think about the complicated processes and then elaborate difficult formulae. It is less risky than Martingale variations.